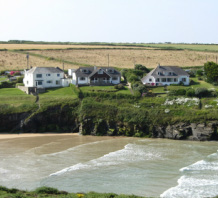 Puffins at Porthcothan Bay is a spacious family holiday house, situated directly above the beach, with magnificent views over the bay and direct access on to the North Cornwall Coastal Path and beach below. 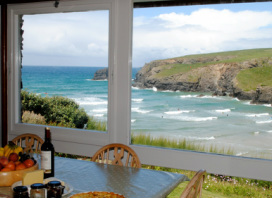 The house was built in 1963 and has been owned by the same family ever since, with generations of children coming back year after year to enjoy the stunning setting, the beautiful beach and great surfing. Puffins sleeps 14 people comfortably with an open plan sitting/dining room and a connecting kitchen. There is another bright, cosy sitting room, with a fireplace, opening onto a south facing terrace and garden. The front of the house has a paved area and garden that overlooks the beach, sea and National Trust land across the bay.